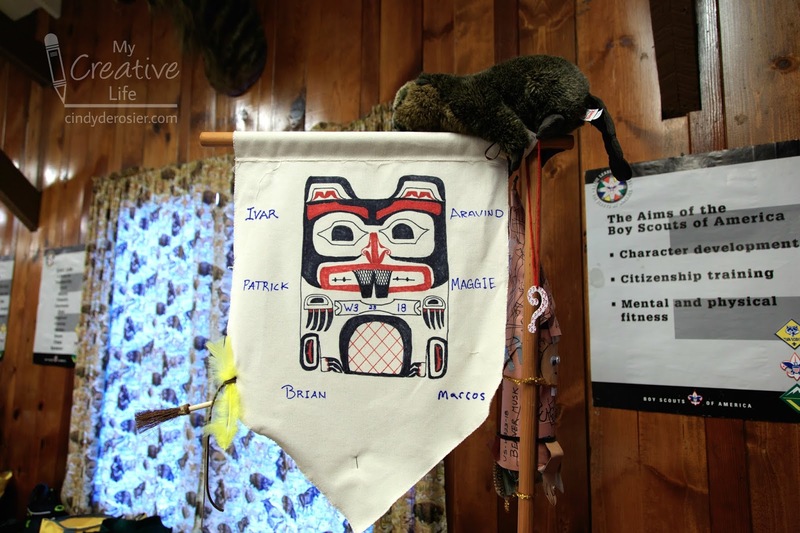 This is the patrol flag that Steve's Beaver Patrol made at Wood Badge. 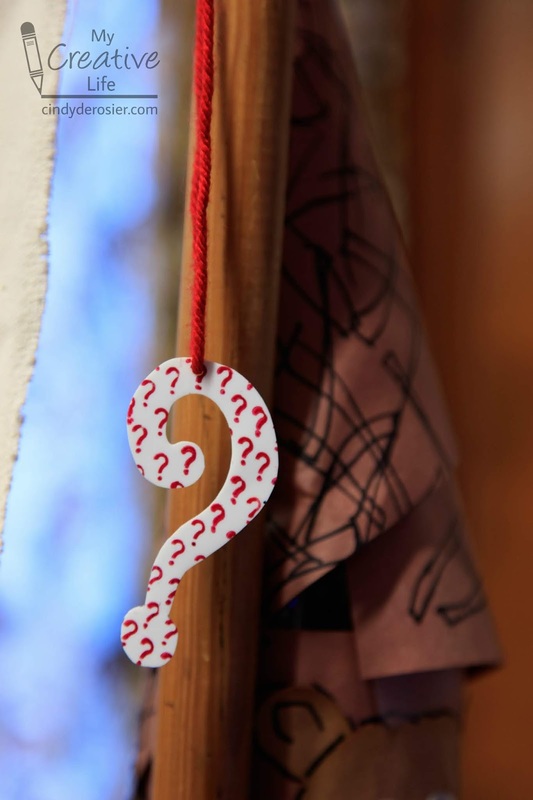 Did you notice that question mark hanging from red yarn on the right? It's an award for a daily challenge that the Beavers won. Each day during Wood Badge, there is something called a Whatsit Box with a mystery item inside. The patrol that comes the closest to guessing the item gets to display an award on their banner. Knowing that I am crafty, Steve volunteered me to figure out and make the awards tokens. They'd need 6 - one of each day of training and it should have something to do with a Whatsit Box. A question mark seemed perfect. 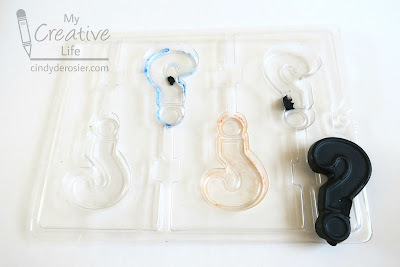 About a week before the tokens were due, I swirled several colors of Model Magic and pressed them into a question mark candy mold (affiliate links here and through the rest of the post), confident that they'd work perfectly. I let them dry, then pried them out of the mold. Alas, Model Magic is great for many things, but not for being pried out of a deep mold. 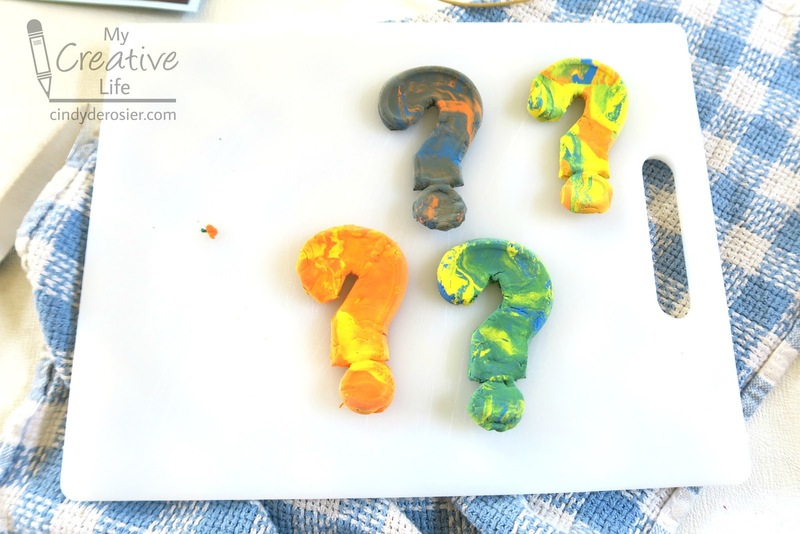 The question marks were pretty, but they emerged with small tears and were definitely not sturdy enough. Drat. For Attempt #2, I used Sugru. If you've never played with Sugru, let me tell you that it is really neat stuff. It is moldable glue that dries strong, bonds permanently to almost everything, and is waterproof. The fact that it bonds to everything meant that I couldn't press it into a mold, let it cure, and pry it out later like I did with the Model Magic. Following the manufacturer's instructions, I coated the mold with oil, pressed the Sugru into the oily mold, and waited for it to cure. Unfortunately, no matter how much oil I used, there always seemed to be a small spot that stuck. Aargh. At this point, I should explain that when I agreed to make the Whatsit prizes, I didn't fully understand what I was making. I actually thought they would be attached to the Whatsit Boxes, which would then be the prize for the winning patrol. Because of this (incorrect) assumption, I didn't ask the important questions nearly soon enough in the process. How big should the award be? Does it need to be weather-resistant or will it stay indoors? Will it be attached to anything? 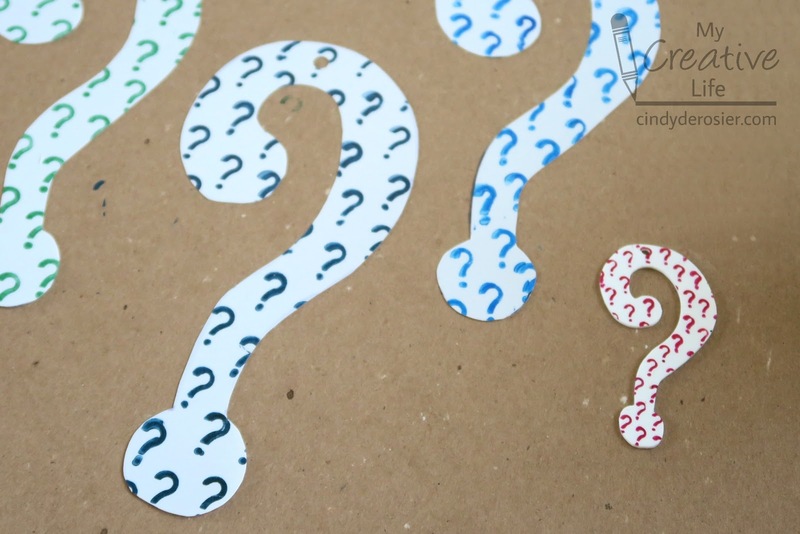 Once these were asked and answered, I realized the perfect material was upstairs in the craft room. 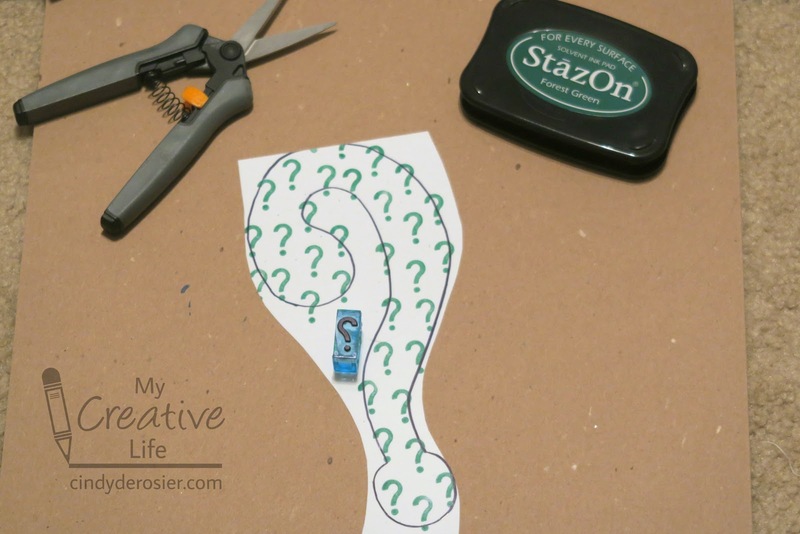 It's a childhood favorite that continues to be one of my go-to craft supplies - Shrinky Dinks! I started by creating a template of a last question mark. I traced it onto white shrink film using a Sharpie. I used Staz-On ink and the question mark from this stamp set to stamp all over the front. I used a different ink color for each of the six question marks. (By happy coincidence, I own six colors of Staz-On!). Then I carefully cut them out with my beloved microtip scissors and punched a hole in the top of each. It only takes about a minute in the toaster oven to shrink plastic. I did them one at a time so I could deal with any necessary flattening. Here you can see the size difference between the original plastic and the shrunken shape. The final step was threading coordinating yarn through each question mark. Because the hole was pretty small after shrinking (and yarn is tough enough to thread even through a big hole), I used a yarn needle, which made it super easy. I am really happy with how these turned out. Congrats to the Beaver Patrol and to the other two patrols that won during Weekend 1. Good luck to all during Weekend 2! Shrinky Dinks saved the day!! I loveeeeeeeee that!!!! They look awesome!!!! !